Representation With Clarity of Purpose And Thought. 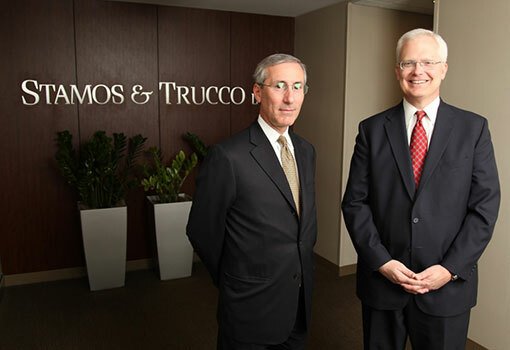 Stamos & Trucco LLP was formed in 1990. We are principally trial lawyers, having taken over 90 cases to jury verdict since our founding. Our areas of litigation practice include commercial and civil disputes, defending physicians, health care facilities and attorneys in professional liability claims, representing professionals and organizations in regulatory matters and defending toxic tort claims. We also provide corporate counseling, representation in commercial transactions, executive and professional employment contract advice and representation of parties in commercial real estate transactions. Our founding partners have been voted Illinois "Superlawyers" every year since the inception of the award in 2005 and our partners are AV rated by Martindale Hubbell. We take great pride in the results we achieve for our clients and in the referrals we receive from our clients, adversaries and professional colleagues. We have successfully litigated and tried cases in many areas of commercial and business law. Our litigation experience includes the business and regulatory aspects of health care as well as the defense of medical malpractice actions.